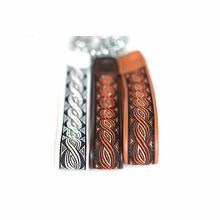 At Dog Moda we design and handmade leather greyhound collars. 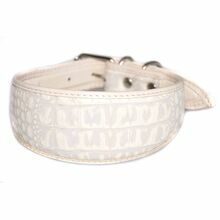 Our leather greyhound collars are stylish, look smart and at the same time are practical enough to be worn everyday. These traditional collars feature our improved buckle design and are generously padded for your greyhound's ultimate comfort. Our soft leather greyhound collars are fully lined, comfortably padded and are especially shaped for greyhound's long and delicate necks. 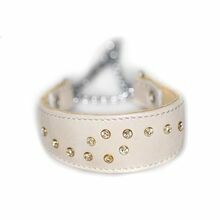 The 'fishtail' design is wider than standard dog collars, which makes these collars safer and more comfortable to wear. 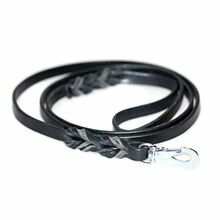 Our handmade greyhound collars have strong stainless steel buckles and solid D-rings, as well as two rivets for extra durability and strength. We have presented some of our most popular Greyhound collars for your consideration. 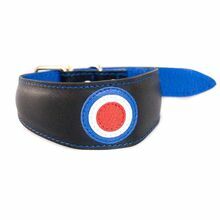 However, please browse through our lined and padded Greyhound collar collection available in a great variety of other colours and designs. See which one you like! Apart from 'special collars for special dogs' argument, greyhounds need wider dog collars resembling fishtail shape (widest in the middle getting narrower where it buckles together) because with them having such long slender necks a normal dog collar could easily damage their delicate necks when they pull. As a result our greyhound collars are soft and padded, but most importantly are wide, so that collars do not put a lot of pressure on one small area of greyhound's fragile neck. In fact, any dog that has a neck prone to injury due to its size or shape, shouldn't be on an ordinary narrow flat collar. 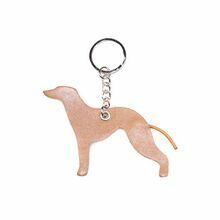 Moreover, due to the shape of greyhound's head, you would find that a lot of them can slip out of a normal narrow collars. Our greyhound collars sizes are given as neck measurements, not the total length of the collar. The neck size given is the distance to the first (B) and the last (C) hole from the buckle (A). Large greyhound collars: 40 - 50 cm (16" - 19.5"), 5.5 cm wide collars for large Greyhounds. 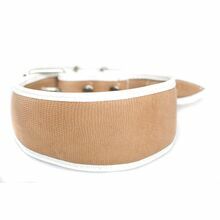 Medium greyhound collars: 33 - 42 cm (13" - 16.5"), 5 cm wide collars for medium Greyhounds. 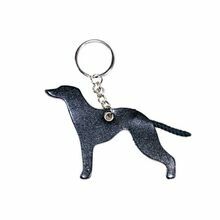 Stylish soft padded leather greyhound collars, dog leads, treat bags, key rings and accessories designed handmade in UK for Greyhounds & other hounds. If you need help with choosing Dog Moda products for your Greyhounds or have any questions, do not hesitate to call us on +44 (0) 20 3582 4532 or send us a message. We are open to help on Monday - Friday: 09:00 - 18:30, while on Saturday - Sunday: 10:00 - 16:00. 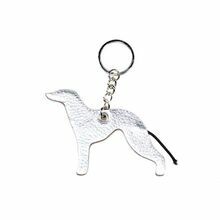 As specialist Greyhound collar, dog lead manufacturers and leading designers of hound collars & accessories we design, make and have in stock a range of Greyhound accessories which make perfect gifts for all dog and Greyhound lovers. 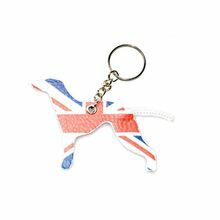 Dog Moda's custom designed dog show prizes, greyhound key rings, souvenirs keyring rosettes and accessories are supplied to various dog show clubs, associations and charity organisation$. I’ve had this red hearts greyhound collar for over 5 years now and I’m so pleased with the quality. Thank you! Collar came quickly and was the right size for my greyhound. Very high quality collar, unlike plastic or nylon variations I had in the past. This one is made of good leather and very generously padded. Most importantly is that it reflects light, making my little greyhound very visible. Thank you! 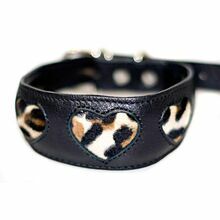 I just love these bespoke greyhound collars!!! They are awesome! Very pleased with this traditional leather greyhound collar. Nicely made of very soft real leather. Love it!